Multiscreen TV viewing refers to a spectrum of media productions that can be watched on TV screens and companion screens (e.g., smartphones and tablets). TV production companies are now promoting an interactive and engaging way of viewing TV by offering tailored applications for TV programs. However, viewers are demotivated to install dozens of applications and switch between them. This is one of the obstacles that hinder companion screen applications from reaching mass audiences. To solve this, TV production companies need a standard process for producing multiscreen content, allowing viewers to follow all kinds of programs in one single application. 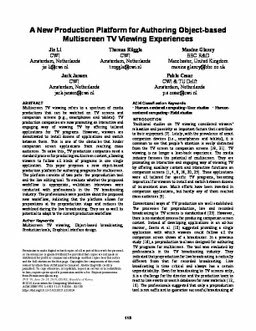 This paper proposes a new object-based production platform for authoring programs for multiscreen. The platform consists of two parts: the preproduction tool and the live editing tool. To evaluate whether the proposed workflow is appropriate, validation interviews were conducted with professionals in the TV broadcasting industry. The professionals were positive about the proposed new workflow, indicating that the platform allows for preparations at the preproduction stage and reduces the workload during the live broadcasting. They see as well its potential to adapt to the current production workflow.